Opening night of Hawthorne’s winter meet is only a week away and the Friday, January 5th conditioned sheet lists both an $11,000 ICF Open Pace and a $10,000 Open Pace as its headliners. The state-bred Open for male pacers could turn out to be an early preview for the Dave Magee Closer Series that gets under way on February 2nd with its first round legs. The second $9,000 legs will follow on February 9 with the top 10 money winners of the Magee Late Closer knocking heads on Friday 16 for a very nice purse of $30,000. The Magee Late Closer has13 pacers eligible to compete: Captain Rhett, Cole Heat, Dakota Roadster, Fox Valley Cupid, Gabe Henry, Gibbs, He Gone Jack, Lucky Crusader, Mystical Walter, NJ’s Go Johnny Go, Slzburgerslzburger, Sporty Redhot and Uptown Sleaze. Both Captain Rhett and Gibbs were victorious on last year’s Night of Champions. The Jim Horvath Stable’s Captain Rhett captured the $180,000 Robert F. Carey Final for 3-year-olds males while Gibbs notched the $90,000 Robert S. Molaro aged pace for trainer Jim Eaton. Captain Rhett and Gibbs have been competing in Ohio at Northfield Downs after the close of Hawthorne’s 2017 summer meet. In six starts in the Buckeye Captain Rhett has chalked-up three wins, one second and one third and most recently a close-up a fourth place finish in a high-level conditioned pace. In 2017 the Duneside Perch gelding has raked-in purse earnings of $145,835 for Illinois owners Harvey Grieff and Robert Verdun. Gibbs has won twice on the Ohio half-miler including an $11,000 Open II Pace in early November for Michigan owner Rick Howles. The Sportsmaster pacer has been a consistent starter in Northfield Park Opens and has made over $70,000 as a nine-year-old. While the ICF Open Late Closer for “the boys” has 13 eligible pacers, the ICF Open Series for “the gals” saw a reduced number of eight owners send in a $200 nomination fee check for a crack at that winner’s share of a $30,000 pot in the Saturday, February 3 Final. Heading up the “Walter Paisley’ Late Closer for state-bred distaffers are Bucklegirl Bobette and Fox Valley Charm, the one-two finishers on the Hawthorne’s Night of Champions. Only a nose separated those two mares in the $60,000 Tony Maurello Championship. The Bob Walker Stable’s Bucklegirl Bobette is being pointed for Hawthorne’s 2018 winter meet. (Four Footed Photo). The Bob Walker trained Bucklegirl Bobette ended her 2017 season by winning six of her last seven starts and pulled down $75,177 in purse earnings while going postward a modest 15 times, her last in mid-October. On the other hand Fox Valley Charm was sent to trainer Dirk Simpson in Pennsylvania after Hawthorne’s closing and has been a steady purse-earner in the Preferred mare ranks at The Meadows, banking almost $23,000 in eight starts there for Sherman, Illinois owner Peter Karras. Others eligible to the Paisley Late Closer are Char N Marg, Fox Valley Aubry, Fox Valley Hermia, Mimosa Party, Miss M A Jones, Phyllis Jean and State Street Liz. However, both Sporty Redhot in the Magee and Phyllis Jean in the Paisley will be “no-shows” in their respective winter Late Closers says their Berwyn, Illinois owner Al Beals. “I changed my mind about bringing them back for the Hawthorne winter meet after talking to both my east coast trainer and my Illinois trainer,” said Beals who nominated both ICF pacers on December 9 and did an about-face on the matter about two weeks later. The soon to be 5-year-old Phyllis Jean had a terrific and a busy 2017 for Beals with over $85,000 in purse earnings in 42 trips postward. She took her mark of 1:52.2 at The Meadowlands back in May. Since Sporty Redhot ($52,489 in 25 starts) left Illinois the soon-to-be 4-year-old has split his time racing for trainer Rick Dane Jr. at both Yonkers and the Meadowlands. Of the 15 Hawthorne Winter Late Closers made available, five had to be canceled because of insufficient entries. All five were for trotters. Now That’s Cold: Eleven qualifiers were raced yesterday at Springfield on a “good” racing surface during a bold chilling temperature of 14 degrees. Because of the adverse conditions the stewards knocked four second off qualifying time. The fastest winning mile was a 2:01 flat front-end clocking by the Jim Eaton Stable’s mare Gypsy Bellevue (Mike Oosting), two full seconds faster than the second quickest paced by the winning mare Morgangetsherway. Gypsy Bellevue had been sidelined since May 21 at Hawthorne. Eaton also had his Invite trotter Whizzer White (Mike Brink) prevail in 2:04.2. A winner of almost $84,000 in 2017, the soon-to-be 6-year-old trotter hasn’t raced since a start in late July at Hoosier Park. Entry Details: Entries for Hawthorne’s Friday, January 5 opener are due this Monday morning (January 1) by 9 am. Online entries (www.ustrotting.com) are encouraged. The Race Office phone numbers are (708) 780-3690 and (800) 850-4188. FAX at (708) 780-3757. They’ll be a double draw on Wednesday, January 3) for both Saturday’s January 6th and Sunday’s January 7th cards. Horsemen must declare by 9 am Wednesday morning. Hawthorne will conduct qualifiers on Saturday January 6 before the regular card. Horsemen must declared by 9 am Wednesday, January 3. Ship-in date at Hawthorne for both horses and dorm residents is Tuesday, January 2nd. The Paddock will be Barn D. The Ship-In barn will be Barn 1. Horsemen Reminder: Any horse that raced at Hawthorne last September, and hasn’t started since, can be entered and race on opening weekend without qualifying. The driver and trainer colony for Hawthorne’s upcoming winter meet will get a huge boost with veteran horseman Larry Stalbaum coming from in the east coast with a large stable. A check of Hawthorne’s stall allocations for the January 5th start of the meet shows that the 54-year-old Stalbaum was allocated 20 stalls, making his barn the largest stable on the grounds for the winter meet. The native of Valparaiso, Indiana, has racked up 0ver 5,700 dash winners since he began driving professionally in 1986. He also has trained over 1,000- winning horses. Stalbaum has driven at tracks all over the country and he’s been behind horses with over $1 million in purse earnings for the last 25 consecutive years. Larry comes back to Illinois fresh off his first driving title at the Batavia (NY) meet that concluded last Saturday. Stalbaum competed in the mid-1990s on the Chicago circuit at Sportsman’s, Maywood and Balmoral Parks. Stalbaum’s best season for winning drives came in 2004 with 421when he was one of the top drivers in Michigan. He left the Wolverine state after the 2005 season and went to the east coast where is money won total jumped by over $1 million the next year competing at tracks in the state of New York and in Pennsylvania. Larry’s highest total in money won for a season was in 2012 with $4.38 million. The bulk of that amount came at Yonker’s Raceway in New York City. The long-tenured horseman is no stranger to being the leading driver at a racetrack. Over his 32-year career Stalbaum has won dash honors at Northville Downs, Hazel Park, Sports Creek and Jackson Harness Raceway in Michigan, Raceway Park in Ohio, Cal Expo in California, and at New York State’s Monticello Raceway, Buffalo Raceway and Batavia Downs. Through yesterday Stalbaum has driven 5,738 winners with 339 coming in 2017. Horses he’s driven in his career have earned just over $39 million in purses. Crawford Hawthorne Bound: With no harness racing meet in Michigan until the month of March veteran horseman Keith Crawford will be coming in for the Hawthorne winter meet. The 71-year-old Michigan native was assigned five stalls at Hawthorne. The stable his headed up by Crawford’s soon to be 6-year-old trotter I Could Care Less (1:55.3), an eight time winner in 2017 including the Bea Farber Late Closer Final on the Sticky, IL one mile oval. This year the homebred son of Glidemaster made over $46,000. Crawford has more than 3,500 career dash winners and has conditioned over 1,000 winners in his career. Pre-Winter Meet Qualifiers: There will be qualifying races held at Springfield Thursday, December 28th at the State Fairgrounds. Entries can be made online or by phone on Wednesday, Dec. 27 from 8 am through 11 am by calling Le Ann Shinn at 618-783-2589. There will be NO entry fee for the qualifiers with the costs being picked up by Hawthorne Racecourse and the IHHA. Hawthorne will conduct qualifiers on Saturday January 6 before the regular card. Horsemen must enter by 9 am on Wednesday, January 3. Sixty Day Qualifier Exception: Speaking of qualifiers, horsemen are reminded that any horse that raced at Hawthorne last September, and hasn’t started since, can be entered and race on opening weekend without qualifying. First Conditioned Sheets Up: The Conditioned Sheets for Hawthorne’s opening weekend programs have been posted on both the Hawthorne and USTA Web-Sites. The ballots went out this week to every member in our state for his or her choice as the 2017 Illinois Harness Horse of the Year. While the official announcement won’t take place until December 20 the unbeaten 2-year-old Fox Valley Gemini looks to be a shoo-in for the top honor. 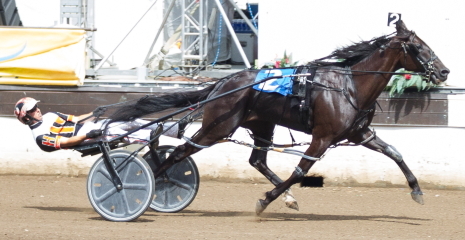 You can’t argue with perfection and that’s what the Jim Ballinger owned freshman pacer Fox Valley Gemini was in his first racing season for the Terry Leonard Stable and driver Casey Leonard. The Yankee Skyscraper gelding, out of the Cole Muffler broodmare Epona, went nine-for-nine as a 2-year-old and in most major stakes the outcome wasn’t even close. Fox Valley Gemini average winning margin in an ICF stake final or elimination was by almost three lengths and that includes his 3 and 1/2 victory in the $195,000 Incredible Finale Final on Hawthorne’s Night of Champions. Even though Fox Valley Gemini dominated the ICF 3-year-old male division, the pacer didn’t “wow” the Leonard’s when he first arrived at their farm. “Gemini” didn’t show a whole lot when we got him,” said Trainer Terry Leonard. “The Ballinger boys got him ready and sent him up to us to finish him off about a month or six weeks before he was ready to start. You might think that 26 last quarter was the fastest for the Terry Leonard trainer pacer as a freshman but you it wasn’t. 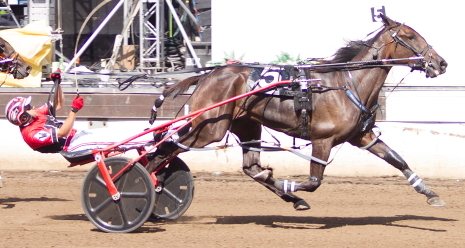 On July 22 Fox Valley Gemini had a scorching 25.3 last panel in his Incredible Finale Second Leg triumph. “He just exploded that night coming off the last turn,” said Terry. Besides sweeping Hawthorne’s Incredible Finale Stake Series, Fox Valley Gemini, breezed in his Cardinal elimination and the final and did the same at Springfield where he took his mark of 1:52.2. The only major ICF stake the freshman didn’t win was the Du Quoin. He didn’t make the trip to the southern Illinois State Fair. Instead Fox Valley Gemini got a well-earned four week rest after his Springfield conquests. The decision to give the R&R to the freshman pacer proved to a wise one. The freshen-up Fox Valley Gemini went out and rattled off victories on consecutive September Saturdays in the third and fourth legs of the Incredible Finale before his romp in the Hawthorne championship. Fox Valley Gemini hauled in $157,560 in his initial racing season for his Atwater, Illinois owner. He won’t get back in training until after Hawthorne’s winter meet is over. The annual USTA District 5 (Illinois) meeting will be held on December 20th at the Poe’s Catering at 7162 Britten Road in Springfield, Illinois. Tony Morgan made a triumphant return to Hawthorne on the Night of Champions. (Four Footed Photo). Morgan Milestone: One-time Chicago circuit kingpin Tony Morgan is about to eclipse a monumental milestone in his illustrious driver career. Coming into tonight (Dec. 15) the 59-year-old Morgan is only 9 victories away from 16,000 career dash winners. Only driver Dave Palone with 18,000-plus has recorded more than Morgan, a long-time former president of the IHHA. Tony left Illinois for the greener purses of the Casino abetted east coast racetracks after the 2005 season after winning 700 races and tallying $5.1 million in purse earnings. In his first campaign on the east coast Morgan’s dash winners soared to a career high 1,004 while horses he drove banked $3.4 million more than in 2005. The Ohio native then followed with money won earnings of $10.45 million in 2007 and a career highest $10.80 million in 2007. Morgan’s lifetime money won total is nearing $128 million. The Warwick, Maryland resident came back to Illinois for Hawthorne’s Night of Champions in late September and drove the Mike Brink Stable’s Illinimike to victory in the $115,000 Kadabra stake for ICF freshmen male trotters. With Hawthorne’s winter session only four weeks away it seems like a good time to chat with the track’s Race Secretary, Robin Schadt and get her thoughts on the meeting that begins on Friday, January 5th and concludes on a special Monday night (February 19th) card. Robin was optimistic that the winter meet will do well at the betting windows. “The handle will be good because there aren’t a lot of products going on against us in the winter,” said the Oak Lawn, Illinois native. The backbone of the winter meet at Hawthorne looks to be the track’s Late Closer Series. Sixteen Late Closer events are being offered by Hawthorne, all with two legs prior to finals which range from $15,000 to $30,000 for ICF Open pacers of both sexes. The winter Late Closers are for horses of both gaits and sexes with lifetime earnings ranging from $10,000 upwards to $40,000 lifetime. A $200 nomination fee was needed for a horse to be eligible. 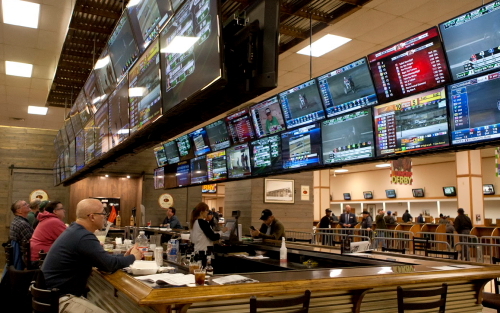 Robin pointed out, and rightly so, that Illinois horse racing forever changed in a big way once full card simulcasting came about. While I loved watching some of the country’s top horses compete at Balmoral Park on American National Nights, and writing about the outcomes, it was very rare to see a big purse go to owners of Illinois based stables. I recall one Balmoral American National Night (2009) when horseman, Roger Welch (now with his barn in Indiana), was the only Illinois trainer to have an American National winner. That night over $1 million in purse money went out of state, never to return. The next year it was more of the same. Dirk Simpson, who has since relocated to Pennsylvania, was the lone Illinois horseman to have a champion on American National Night. Again more than $1 million in purse money was raked-in by out-of-state owners and stables. January Claiming Series: While the first legs of Hawthorne’s Late Closers will be raced on either January 12, 13 or 14, its Winter Claiming Series gets under way the first weekend of the meet. Nominations (with a $200 fee) for pacers with a $6,000 claiming tag and for those with a $10,000 claiming price ($300 fee), must be received by the Hawthorne Race Office by December 18th. Both the filly and mare and the colt and gelding $6,000 Claiming Series Finals will carry a $12,000 purse while the $10,000 claimers will vie for a $20,000 pot in their respective finals. 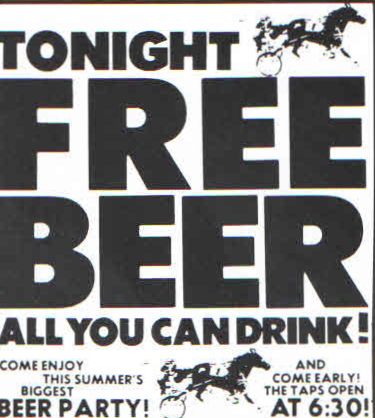 Last week we gave you some of our favorite harness racing promotions on the Chicago circuit through the years, so this time around let’s take a look at a promotion that would be best forgotten and never repeated and that would be Sportsman’s Park Free Beer Night back in July of 1974. And to facilitate that their patrons would have the opportunity to leave the track “drunk as a skunk” Sportsman’s Park opened its beer taps at 6:30 pm, a full one hour and forty five minutes before the first race post. This wasn’t an original Sportsman’s Park promotion idea. The track’s harness kingpin got the brainstorm from major league baseball. That was a time when the country’s pastime wasn’t drawing very well at a number of its ballparks. In an almost desperate attempt to try and lure people to its ballparks, Ten Cents Beer Nights were held at some facilities where beer back then sold for 65 cents for a 12-ounce cup, a far cry from what it is today. On June 4, 1974, about six weeks before Sportsman’s Park’s Free Beer Night, the Cleveland Indians held a Ten Cent Beer Night at old Cleveland Stadium. A crowd of over 25,000 showed up, more than twice the normal attendance, and were limited to SIX cups for each trip to a Beer Stand. And the ball club didn’t put a limit on how many purchases could be made during the game. Not surprisingly, as the night got longer, the crowd got more and more rowdy. It didn’t take long for a woman to run out to the Cleveland Indians on-deck circle and flash her breasts to the crowd. Later a naked man ran around the field. Then a father and son mooned the bleachers. As the night went on the ball players were pelted with hot dogs and then firecrackers were thrown into the Texas Ranger’s dugout. With the scored tied in the ninth inning, more and more people ran onto the field and a riot ensued. The Rangers players went on the field with baseball bats to protect their teammates from the unruly crowd which caused more fans to run on the field. The Indians players left their dugout to help fight alongside the Rangers players. The police had to be brought in and numerous fans were arrested and charged with disorderly conduct. When the bases were literally stolen (and never returned) and the playing field a mess, the umpires had little choice but to forfeit the game to the Rangers. With this fiasco of a promotion giving baseball an unforgettable black eye, you might think Sportsman’s Park management would then put the brakes on its planned Free Beer Night . . . but you would be wrong. The racetrack went ahead with its Free Beer Night and vindicated it by announcing it would issue a one cup per person per beer stand visit to control how much alcohol a patron would consume. However the race track put no limit on the number of free beers dished out to its patrons through the night. Not unexpectedly many patrons who got their free beer, immediately went to the back of the beer line and drank their way to the front to have another, and then another, and . . . 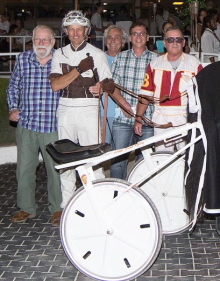 While the track’s attendance got a boost that night, the mutuel handle didn’t. It shouldn’t have been much of a surprise that intoxicated people prefer to keep drinking free all night and keep their money in their pockets rather than take it out and bet on the horses. Even if that was an accurate statement, and that’s doubtful, how can a racetrack justify a promotion they knew would send hundreds and perhaps thousands of drunk drivers on the road? Fortunately, Sportsman’s Free Beer Night dumb promotion ended up as a one and done irresponsible marketing ploy.